Magic Yacht Tours is a subdivision of Adventures Abroad Worldwide Travel. In 1987, Adventures Abroad carved a niche in the travel market by offering a unique brand of small group tours based on a principle of providing high-quality travel alternatives at great value. Almost 25 years on, Adventures Abroad is a truly global operation, offering a massive range of exciting itineraries to over 120 countries worldwide, and has cemented for itself a reputation as a reliable and innovative heavy-hitter in the travel industry. After perfecting the recipe for successful cultural, active, educational and custom group tours around the world, Adventures Abroad then looked to its own shores and implemented that same winning formula in North America. 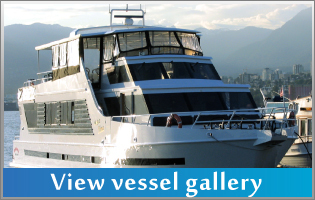 The result is Magic Yacht Tours; our thrilling series of vacations that take advantage of North America's stellar landscapes and attractions, its fascinating cultures and its proud heritage. Whether it's a once-in-a-lifetime Vancouver wedding cruise, a corporate conference, a dinner cruise, or just simply a cruise to soak in the sights of the Burrard Inlet, Howe Sound or Indian Arm, our dedicated team - from the Captains, deckhands and office staff, to the Executive Chefs, kitchen staff and experienced servers and bartenders – will ensure that you experience nothing but smooth sailing on your voyage.